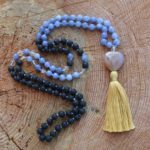 108 Aquamarine , Citrine, Black Lava Stone, Agate heart Guru bead Mala. 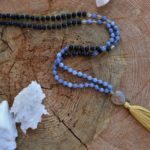 Cotton tassel mala. 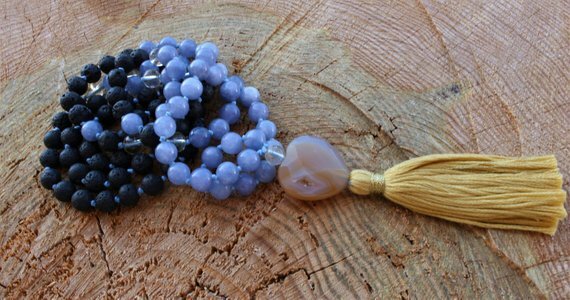 108 beads Hand-knotted Mala, 108 Aquamarine , Citrine, Black Lava Stone, Agate heart Guru bead Mala. 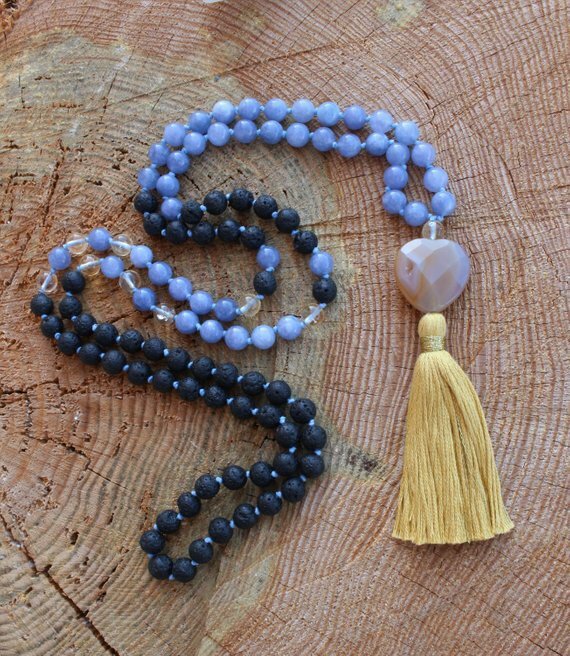 Cotton tassel mala. Aquamarine is a Water element stone, powerful for cleansing the emotional body and opening communication. 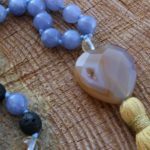 Its gentle energy brings emotional patterns to the surface and assists in understanding the reason for holding onto old thoughts or patterns that are limiting forward motion. It also identifies where ego is causing one to overreact, assume a victim/abuser role, manipulate others, or martyr oneself. Aquamarine helps balance excessive anger or fear, and clears past emotional, physical or verbal abuse. Aquamarine is useful for moving through transition and change, its cleansing energy removing resistance and helping one overcome fear of the unknown. It helps not only in the release of emotional baggage, but the clearing out of physical items and Chakra Healing. 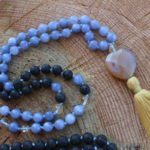 Aquamarine is perhaps the strongest stone for clearing and activating the Throat Chakra. It stimulates energy from the heart to the throat, allowing one’s deepest and heartfelt truth to be communicated. Aquamarine is a stone of empowerment, for men and women alike. It helps in the realization that not all power comes from force. There is also power in aligning with the yielding, resilient vitality of life, and in promoting truthful and compassionate communication. 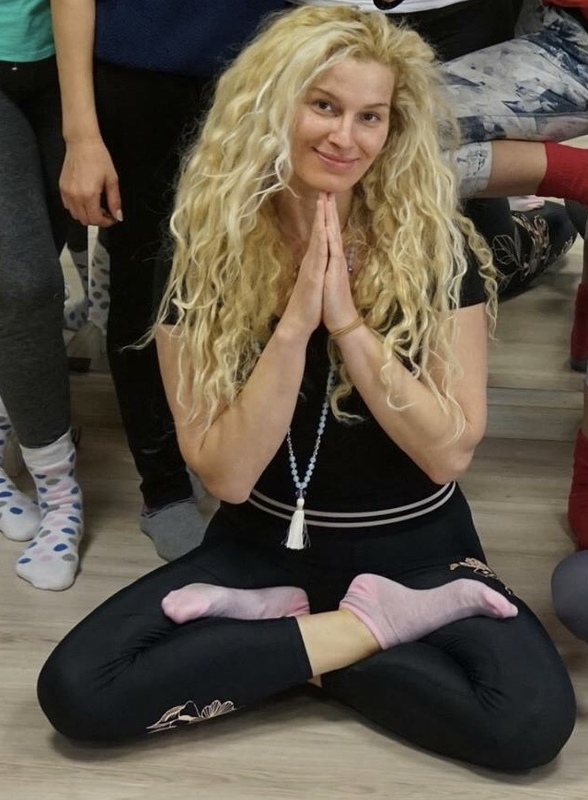 It lends women the courage to express their inner knowing and enhances their intuitive abilities, and helps dispel the emotional numbness and difficulty men sometimes experience in communicating their feelings. 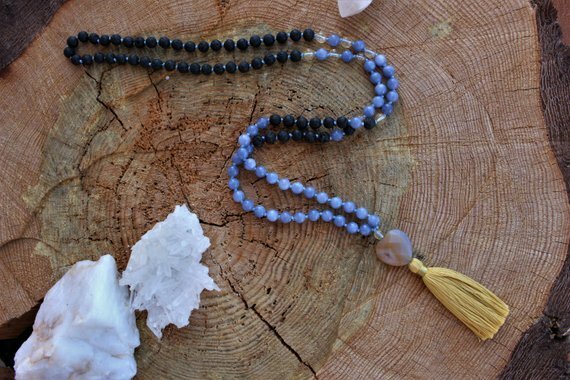 Black Lava Stone has been for centuries for its healing properties and energetic qualities. Emotionally it has grounding qualities, calming the emotions. 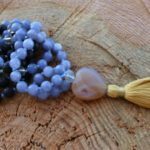 Because it comes from raw energy, it’s considered to be a stone of rebirth and shedding unneeded layers of emotional attachment. Spiritually Lava stones are fantastic for stabilizing and grounding the root chakra. This is because of the strong connection to the earth and its creation within the center of Earth. Agate Crystal takes part and it is the most popular of the Chalcedony family. 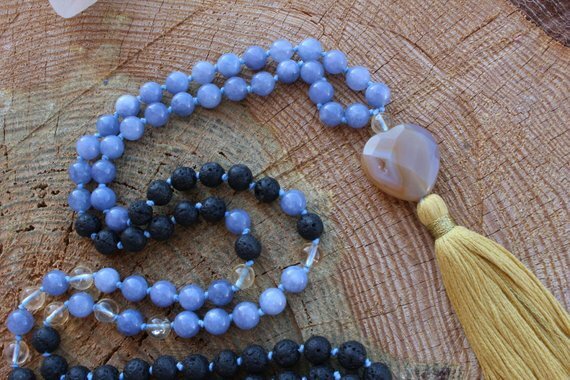 It helps negative energies to be dispelled, and you will be protected from any kind of negative attack on your body, heart, mind, and spirit. Agate will work as a source of support and encouragement, especially when it comes to work and career. 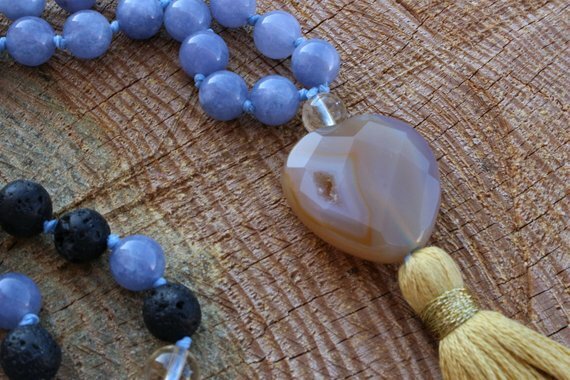 The energies of Agate will keep you inspired, motivated, creative, and productive. It’s a stone that will also fill your life with joy, gladness, and optimism. Whenever you feel low and uninspired, Agate will infuse you with happy and fun energies to make you feel better. Called The Merchant’s Stone for its properties of increase in the cashbox, sparkling yellow Citrine not only assists in acquiring wealth, but helps in maintaining it. It is a stone of abundance and manifestation, attracting wealth and prosperity, success and all things good. It also encourages generosity and sharing good fortune.Citrine assists in all fast money ventures, and is especially helpful in financial speculation and for commercial success. Citrine strengthens the inner light and sparks creativity and imagination. It is ideal for artists of all kinds.